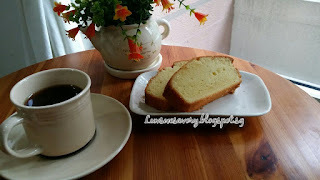 Because of its richness in butter, I seldom bake pound cakes or butter cakes. 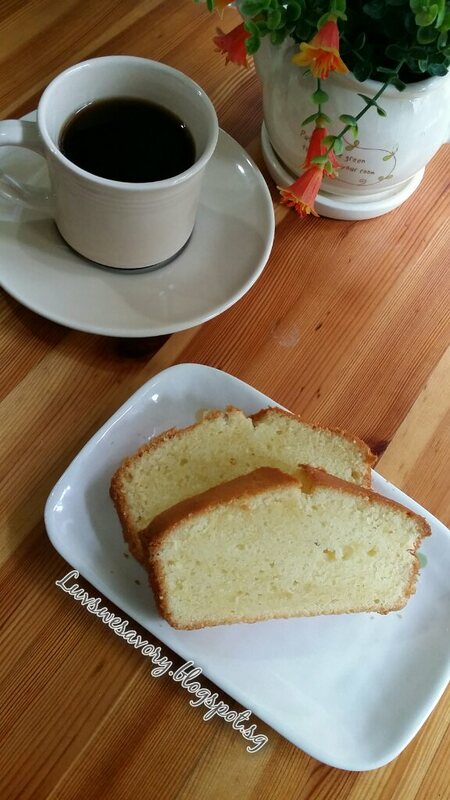 According to wikipedia :The traditional pound cake refers to a type of cake traditionally made with a pound of each of four ingredients: flour, butter, eggs, and sugar. Below my slightly modified version as I've scaled down to about 1/3 recipe and reduced the sugar quantity. 1) Preheat oven to 180°C. Position the rack in center of oven. Note : The temperature of the oven may vary, do adjust accordingly. Sift together the plain flour and baking powder and set aside. 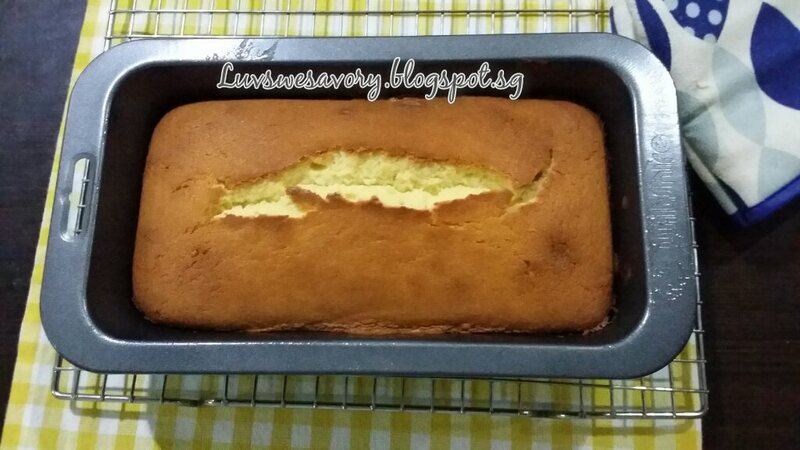 2) Butter (or spray with a non stick vegetable spray) a 4x8-inch loaf pan. 3) With an electric mixer or hand mixer, beat butter and cream cheese in medium speed until smooth. Gradually add caster sugar in 2 additions, beat for about 5 minutes until light and fluffy. 4) Next, add the eggs, one at a time, beating well after each addition. Mix in vanilla. Scrape down the sides of the bowl with a spatula. Adjust the mixer on low speed, add in the flour and beat until just combined. 5) Pour batter into prepared pan and gently tap the pan a few times on table top to release the trapped bubbles in the batter. Bake for 40 - 45 minutes, or until cakes are domed, nicely browned. If the cake seem to be browning too quickly, tent with a sheet of aluminium foil. Check for doneness with a skewer or toothpick inserted into the center of the cake if it comes out clean. 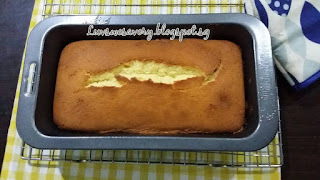 6) Cool the cake in pan for about 10 minutes before turning out onto a wire rack to cool completely. The amount of butter in butter cakes sometimes scare me away from eating/baking them, but they are so sinfully good! I made a cream cheese pound cake before so I know yours is definitely delicious! Lovely cake, Karen! Rich, moist and a delicious treat for tea-time and snacking! Love how you tweaked the recipe Karen, looks delicious!